Once upon a time, there was a one-shot special comic given out on Free Comic Book Day at comic stores everywhere, then that was gone. Now the comic is back, with added content as I Hate Fairyland: I Hate Image Special Edition, a brilliant self-parody to the company that spawned it, by Skottie Young, Now the Free Comic Book Day one-shot will feature four extra pages of story as Gert slices and dices her way through even more of your Image favorites. It also boasts a behind-the-scenes look at Young’s script, layouts, and black and white artwork—all wrapped in a brand-new cover. Gertrude has been stuck in Fairyland for decades when she finally hears of a secret passage that may be her way back home. But reaching it is easier said than done, as she crosses the border into Image where she’ll have to chop her way through your favorite characters from Saga, The Walking Dead, Savage Dragon, Spawn, Descender, Black Science, Southern Bastards, and many more! CAPTAIN’S NOTE: I Hate Fairyland is a personal favorite series currently running, and it should also be yours. 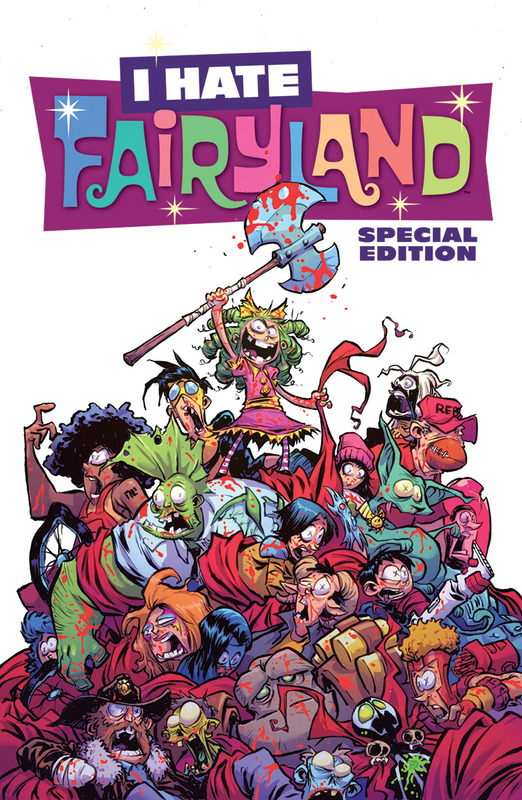 I Hate Fairyland: I Hate Image Special Edition will be available in stores on Wednesday, October 4th.